DC Arts Studios (DCAS) invites you to their annual Spring Open Studios on Sunday, April 29, 10am - 5pm! Take a self-guided tour through the participating artists' studios and have a "behind the scenes" peek into their creative process -- a great way to introduce kids to the arts and learn about different techniques and mediums! Swing by the Willow Street Gallery Group Show and Sale, "The Color Blue" on our first floor. 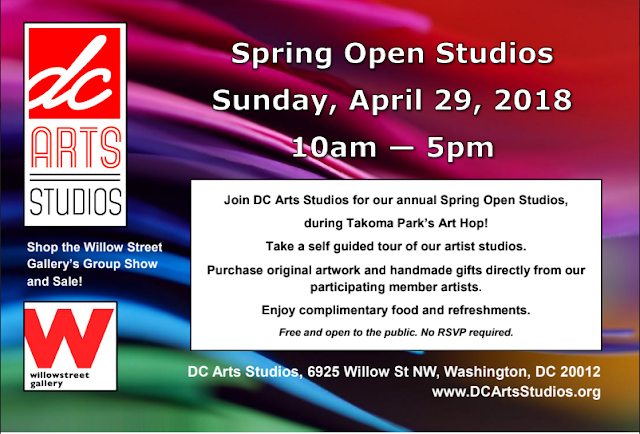 There will be food and refreshments throughout the studios.